There is no shortage to property maintenance chores lurking around your home or business. Everywhere you look there is something to be done. The eavestrough or gutters that run along the perimeter of your roof might not seem important but when clogged, these can mean big trouble. Don’t wait for blockages to give you grief, call the Gorillas instead for your Calgary eavestrough cleaning. The plant life around Calgary is part of what gives the area its world-renowned charm. Residents and tourists might enjoy the greenery but it can be a problem as well. If your eavestrough is not running properly, chances are that it is clogged up with organic debris. Small pieces such as dirt or needles create a foundation for other material to get caught in. Having gutters full of leaves, or sticks prevents water flow as it lands on the surface of the roof. With nowhere to go, that water will just sit in your gutters. This collected moisture allows plant-life to grow and spread over your roof. Damp areas and shelter of debris is home to insects and pests.Through annual maintenance, you can prevent these creepy crawlers and pests from becoming unwanted house guests! Your property maintenance is made out of a bunch of different moving parts. In order to keep the bigger picture running smoothly, you need a plan. By cleaning out your eavestrough twice a year, you can not only clear a path for water to travel but can prepare you for the upcoming season. 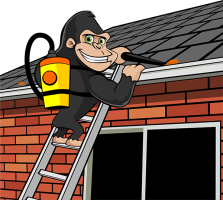 Our Gorillas approach your home or business safely and with a step by step process, designed to give you the best results every time. Larger organics can be removed by hand but smaller bits like dust, dirt and needles require a high-powered vacuum to get rid of them. By having these gutters sucked dry, there is nothing preventing water from flowing freely through your system. Now, our Gorillas take pride in a job well done, so we want to share it with our clients. ‘Before and after’ photos are taken of your eavestrough in order to show how clean this system can be! Your system is tested for free-flowing water before we count the job as done. We aren’t happy until you are, and we know that you will be happy with our Calgary eavestrough cleaning service.